"BloomsburyKids.com is the home of Bloomsbury Children’s Books & Walker Books for Young Readers, general interest publishers of quality children's books for readers of all ages. Our lists include awards winners Princess Academy and Gone Wild, and favorite authors such as Shannon Hale, E.D. Baker , Kevin O’Malley , Carrie Jones, Simone Elkeles and Julianne Moore." I am very happy to have the chance to tell you all about a great publisher of children's books: Bloomsbury Kids! 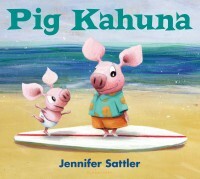 I received 3 books - Pig Kahuna by Jennifer Sattler, The Great Race by Kevin O'Malley and Scapegoat by Dean Hale. This little piggy went to… the beach! From the popular creator of CHICK 'N' PUG comes a winning new picture book about two little pigs, and the treasure that washes up on the beach. Fergus and his little brother, Dink, love collecting the things that wash up on the beach, especially if it means that Fergus doesn't actually have to go in the water. Then one day, they spy the greatest treasure of all-an abandoned surfboard. When no one comes to claim it, they make it the star of their collection and name it "Dave." But when Dave accidentally (on purpose?) gets cast back into the ocean, can Fergus find the courage to rescue him? Whimsically brought to life with Jennifer Sattler's bright, comedic style, here's a story about bravery and brotherhood that little kahunas (and their parents) are sure to love. The Tortoise and the Hare get the O' Malley treatment in this funny retelling of a classic tale. Nate Tortoise is tired of living in the shadow of Lever Lapin. He can't go anywhere or do anything without hearing about the great exploits of that pesky hare. And Lever's head has grown to match the size of his entourage. It isn't until Nate challenges Lever to a race that this hare is put in his place . . . giving new meaning to the phrase "slow and steady wins the race." Kevin O'Malley fans will cheer all the way to the finish line for this clever twist on the beloved fable. When Jimmy Choat's coat goes missing, there's only one person to blame - and it isn't the goat! In the Choat family, you never have to look hard to find a culprit. Missing TV remote? Blame the goat! Lost coat? Keys in the moat? Broken boat? Blame the goat! Cooper and I both thoroughly enjoyed all three books! 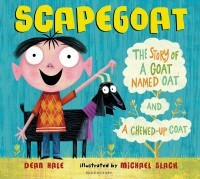 My personal favorite was Scapegoat, because my son is constantly saying "It wasn't me! ", so I felt this book had a great message for my son! The only thing is, now he blames things on "the goat"! Cooper thought this book was funny, and it lead to a great conversation about honesty and not blaming others. Cooper says his favorite of the three was Pig Kahuna. I think he liked this book so much because he loves anything to do with going to the beach, and this book is all about two brothers at the beach who find an abandoned surf board. We find ourselves reading this book quite often, and Cooper even chose this book to take to his class on "Bring a Book to School" day last week. 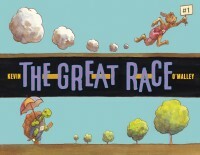 We also really loved the third book, The Great Race. This book is funny version of the tortoise and the hare story. I found this to be a very cute book with great illustrations. I would highly recommend any Bloomsbury Kids book to anyone with children. These books are very entertaining, and the stories are great! BUY IT! You can purchase Bloomsbury Kids books at http://www.amazon.com/ and http://www.borders.com/. WIN IT! One lucky winner will win their own set of Bloomsbury Kids books! Visit Bloomsbury Kids, then come back and tell me about a book that your child would enjoy! Tweet about this giveaway! (Leave your Twitter name and a link) You can tweet this daily: “Bloomsbury Kids giveaway at Opinions of a Moody Mama @coopersmommy @bloomsburybooks http://tinyurl.com/3n7wszc "
My son would like Backbeard: Pirate for Hire. My grandson would enjoy the book Woof's Snacktime. My child would like these books as well as Halloween Surprise. I like Opinions of a Moddy Mama on facebook. I follow Opinions of a Moddy Mama on twitter. I think my daughter would like Quick, Slow, Mango! I'm a facebook fan of Bloomsbury Kids under username Jennie Tilson. I'm a facebook fan of Opinions of a Mooody Mama under username Jennie Tilson. I voted for Opinions of a Moody Mama on Picket Fence Blogs. I entered the SOLO Heavy Duty Plates Giveaway. A book my children would love is Halloween Surprise. They love Halloween! LIKE Bloomsbury Kids on FB- Kimberly F.
My kids would enjoy "Halloween Surprise"
I entered the gaiam giveaway! My daughter would love Amber's First Clue. I think my two oldest girls would like 'Between' by Jessica Warman. Thanks. My son would love Halloween surprise. My kids would like Magical Mischief!! We would also like Freckleface Strawberry Best Friends Forever! Thanks for the giveaway! I voted for you on Picket Fence Blogs (10/1), thanks! I think my oldest son would like The Joshua Files: Ice Shock. We would love the board book "Too Purpley!" my dughter would love this book. The Princess and the Pig. "Americapedia" is my book of choice! My daughter would love The Princess and The Pig! I like Bloomsbury Kids on facebook! 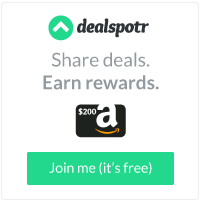 I'd love Backbeard: Pirate for Hire for my son! like blooksbury kids on facebook. I think my daughter would enjoy the book Too Purpley! My daughter would love Magical Mischief! I liked this post of Facebook as Jaime Nicole. They would like Halloween Surprise. already subscribed to the mailing list of Opinions of a Moody Mama. I have just voted for Opinions of a Moody Mama! Entered the Gaiam Yoga giveaway. of the ones listed - Pig Kahuna...She's obsessed w/ pigs!